If your anything like me then you'll be very annoyed with the constant offer of an Ogg Vorbis torrent on Jamendo and then the severe lack of any seeders for the album. Indeed I've one album in particular that I've been trying to download now for 6 months without a single seeder. Given that the files are there, the lack of seeders is very frustrating. However a solution is at hand: download them directly. This does not appear to be an option from the Jamendo site, however I noticed that the Android app is able to download any album I want in Ogg format. After some research and questioning, there is a way to directly download the albums in Ogg Vorbis format to your PC. It is not as simple as a one click, however it is not overly complicated. 1. 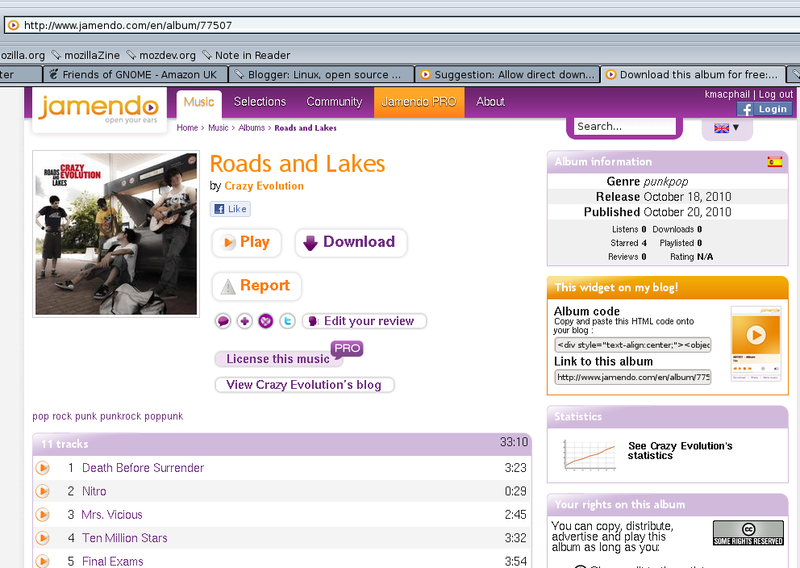 First go to the page of the album you wish to download, in my example I'm using the band I reviewed in my previous blog post: Roads and Lakes by Crazy Evolution. Once your downloads have finished; sit back, relax and enjoy your music in a free format. Step 5: save the .ogg files to the .torrent directory and seed. This way of downloading the Ogg Vorbis files directly from Jamendo doesn't seem to work any more (after the new API v.3 was introdiced).